I love this project from Jessica of Mad in Crafts for several reasons. It’s easy to make, incredibly economical, and it lets you plan out your planting beforehand, which saves time when you’re ready to plant. It also helps prevent seeds from being washed away or forced too deeply into the soil when they are first watered. Every year without fail, the morning I set aside for planting turns into a full-day project. Utilizing seed tape speeds up this process considerably, because you won’t be trying to dig individual seeds out of your packet and placing them in individual holes. Instead, it’s as easy as digging a trench to the proper depth & length, rolling out the seed tape, and covering it with dirt! Start in the morning, and you’ll be done before lunchtime! 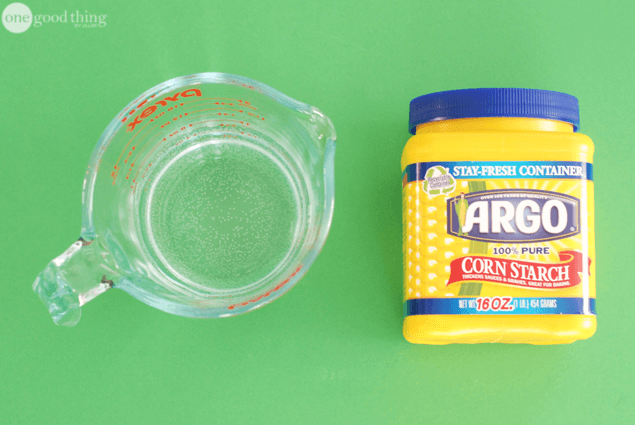 Your first step is to make a simple plant-based “glue” that will help your seeds stay in place on your “tape.” In a small saucepan, combine one cup of water and one Tablespoon of cornstarch, and mix well. Cook the mixture over medium heat, stirring almost constantly, until it starts to boil and make a gel. Once it has gelled, remove the pan from heat and allow the mixture to cool to room temperature. Once your glue is ready, you can start preparing your streamers. I would recommend using white streamers, to reduce the chance of colors seeping into your soil when you plant your tape. Cut a piece (or several, if you’re making seed tape for multiple plants) of your white party streamer to the length you want your row to be. I made my seed tape using peas, so I made a mark at 2-inch intervals along my streamer. 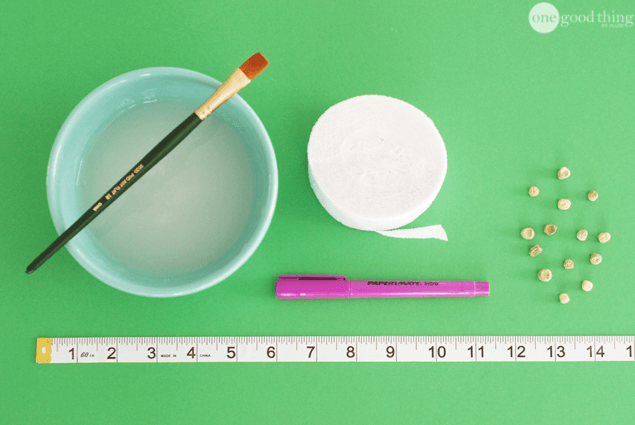 Next, use a small paintbrush or your finger to place a dab of your cornstarch glue onto each mark, and place a seed onto the glue. Do this for each mark on your streamer. Finally, apply a line of cornstarch glue to the edge of the un-seeded half of the streamer, and fold it over on top of your seeds. Use your fingers to press the edges of the seed tape together, making sure to seal it well. Allow the cornstarch glue to dry completely, then carefully roll up your seed tape and store it somewhere safe until you’re ready to use it. The cornstarch glue will be enough to keep the seeds in place, but it isn’t nearly as strong as a commercial glue, so try to be gentle. And make sure to label your seed tapes, so you don’t forget which seeds are inside! D.I.Y. for the D.I.Y. Challenged…like myself! 10 Clever Ideas That Will Make Camping Easier And More Fun! Make Your Own Citronella Candles For Backyard Bugs! How To Make Your Own Customized Bird Seed Blend! How To Clean A Greasy BBQ Grill – No Chemicals Required! Beautifully Simple Garden Markers You Can Make In 15 Minutes! 7 Simple Ways To Keep Your Dog Busy and Happy! Ack! This is a great idea. I’ve never heard of this before! Thank you for sharing. It will make planting so much easier. Love this idea. Our garden for this year has already been planted. I ve never heard of the seed tape before. I checked with my Dad who does our gardening and he of course knew what I was talking about. I don’t know if he would ever use this method,but it’s nice know about. Seems like this would also work – in an even more thrifty and ecological fashion – by using long strips of newspaper. I tried this seed tape idea 2 years ago using thin strips of toilet paper (the thin 1 ply stuff) and not one seed germinated. This could be from a few problems: some seeds can become “in-active” with age, so always check dates on package. Some seeds may need their outer shell “nitched-open” with a knife, prior to planting or pre-soaked. The seeds were possibly damaged by temps or broken. Lastly, the seeds were maybe planted in bad soil or at the wrong depth?! Always check package directions. The DIY seed tape is a great idea because I don’t find commercial seed tape for all the seeds I plan on using. Thank you for such a thrifty and simple idea. I just want to say I am just all new to weblog and absolutely loved you’re blog. More than likely I’m likely to bookmark your blog . You absolutely have fabulous posts. Thanks a lot for sharing with us your web page. What about tiny seeds ? Dose it work well with tiny seeds? Absolutely it does. You can purchase them on a tape done commercially so doing it yourself shouldn’t make a difference. THANKS! Great idea and I’ll be using this next week! California girl transplanted and blooming in Utah. In recovery and loving life.